DS will be present at the International Geneva Motor Show for the first time as a brand in its own right. A significant event that heralds the start of a new era, as DS reveals, for the first time worldwide, its new logo, its “Spirit of avant-garde” brand signature and the New DS 5. On the DS stand (pavilion 6 at the Palexpo), between 5 and 15 March 2015, visitors will be able to discover the Divine DS concept car and two show cars: the DS 5 Moon Dust and a 2015 model of the DS 21 Pallas. The Geneva Motor Show is an ideal opportunity for the new premium brand to reassert its grand ambition, to achieve a real upmarket comeback for the French automotive industry. “From its creation in 2014, the French automotive brand DS drew on an outstanding heritage, that of the DS 19, launched 60 years ago. The legendary car embodies the values of innovation, excellence and avant-gardism. With its sister model, the SM, the DS is the ultimate symbol of French high-end automobiles. 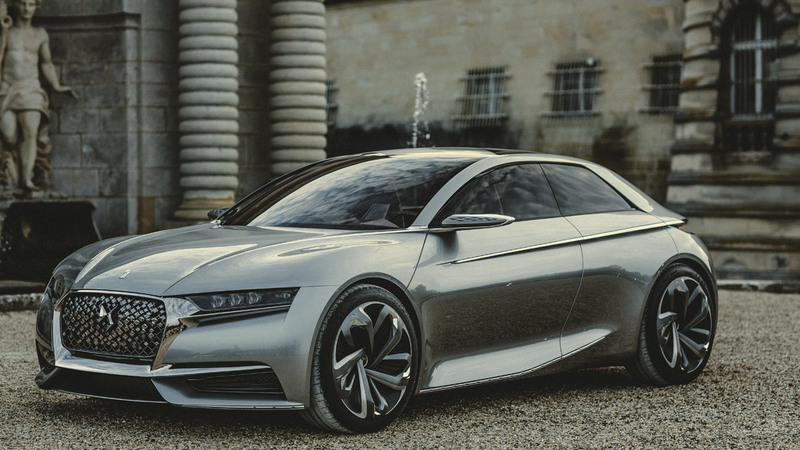 DS became a brand officially on 1 June 2014 and asserted its ambition: the return of French automobiles to the high-end segment. DS upholds the values of innovation and distinction inherited from the 1955 DS. Designed for customers looking to express their personalities, the DS line-up comprises the DS 3, DS 3 CABRIO, DS 4, DS 5, DS 5LS* and DS 6*. For its launch year, 2015, DS is celebrating the 60th anniversary of the original DS. At the Geneva Motor Show the new brand is revealing its tagline —DS AUTOMOBILES, SPIRIT OF AVANT-GARDE—, which sums up the DS state of mind. At Geneva, DS is also unveiling its new DS 5, which inaugurates DS brand identity, with its new front end, advanced-technology equipment, refinement and powerful, efficient engines. Just like the 1955 DS, the new DS brand, officially created in June 2014, was born in Paris. Today, the brand is revealing its new logo, comprising the DS monogram sitting above the name “DS AUTOMOBILES”. The French language was deliberately chosen to recall the brand’s French roots and to reflect DS’s high-end positioning that rests on its best-in-class automotive know-how. DS has also chosen the International Geneva Motor Show to unveil its “SPIRIT OF AVANT-GARDE” brand signature. This signature in English expresses DS’s international ambitions. It reflects the philosophy that guides the Brand towards an offer of remarkably stylish and resolutely technological cars that are extremely refined down to the smallest detail, and offer an exceptionally comfortable ride. “SPIRIT OF AVANT-GARDE” also reflects an attitude to DS. It is an invitation to all those who share this same optimistic vision and spirit of avant-garde. And what better than a car to embody the “SPIRIT OF AVANT-GARDE” signature? Visitors to the Geneva Motor Show will be invited to discover, for the first time worldwide, the new DS 5 – the brand’s flagship model – boasting DS brand identity features, such as the new front end, called DS Wings, and other new features that make DS what it is! With its avant-garde styling, dynamic performance, refinement, attention to detail, and cutting-edge technologies, the New DS 5 features all the attributes of current and forthcoming DS cars. The DS 5 front end expresses status and personality consistent with the brand’s premium placing, with DS LED Vision headlamps and a verticalized grille sculpted with the central DS badge. The grille goes by the name of DS Wings, as a tribute to Citroën’s historic DS models. In the cab, the driver’s “cockpit” is equipped with a latest-generation 7” touchscreen that provides access to a range of connected services. Right from launch, customers will be able to choose between five high-performance engines that combine power (up to 400 Nm of torque, depending on the engine) and energy efficiency (100 g/km or even 90 g/km of CO2, depending on the engine). With these new features, alongside the classic DS virtues such as avant-garde design and refinement down to the tiniest detail, the New DS 5 rolls in as flagship of the DS brand. DS 5 moon dust: a show car that magnifies the new DS 5! The new DS Moon Dust’s radiator grille looks spectacular set against the “textured” mat grey aviation-style bodywork and special-finish chrome parts. The front-end chrome finishes are exceptionally bright, contrasting with other styling parts, in “dark chrome”. To add to the appeal of the front end from every perspective, the hexagonal DS Wings radiator grille boasts a unique, sculptured and graphical design that highlights the DS monogram. Its elegant contour is continued by two luminous wings inside the headlights. The DS 5 Moon Dust also features an ultra-refined interior, inviting the occupants into a world that reflects world-class finishing know-how. The upholstery was made with traditional leatherware techniques, and only the noblest of materials are used. The materials used in the interior of the DS 5 Moon Dust, from the waxed brown leather upholstery with watchstrap stitching, to the door panels in pleated silk, and trims in solid Macassar ebony, are worthy of even the most prestigious design houses. The DS 5 Moon Dust is driven by a hybrid diesel engine. The 2015 model DS 21 Pallas show car is a tribute to the history of the 1955 DS. This iconic car, which celebrates its 60th anniversary this year, is the heritage from which the DS Brand draws its inspiration today. The staff at the DS style centre “revisited” a DS 21 Pallas with the idea of bringing our heritage and the present together in one car. The model on show in Geneva is decked out in ink blue, the launch colour of the New DS 5, and features a criollo semi-aniline leather interior, as found in the top-end versions of today’s DS models. A vision of DS’s future is also on show in Geneva with the Divine DS. This concept car, which was unveiled at the 2014 Paris Motor Show, is a concentrate of the brand’s DNA and represents its future. Designed and created in Paris, this stylistic statement is a combination of refinement and technology. Note the compact four-door outline, sleek and powerful, and the distinctive graphic signatures. The bold finish of the interior is utterly unique. The advanced technology of Divine DS includes laser headlights, slats on the rear window that can be raised to optimise streamlining, on-board rear-view capabilities by camera and a predominantly digital cockpit. Divine DS inaugurates the “Hypertyping” concept that offers three interchangeable interior ambiences, each with their own bold and unique personality: “Parisian Chic”, “Male” and “Fatal Punk”. A new touchscreen in all the DS models in the first half of 2015. The screen in the New DS5 is compatible with the New Mirror Screen system, which offers access to compatible smartphone applications from the car’s screen, without even touching the telephone. It will be available right from the car’s commercial launch. Monitoring pack: virtual servicing log (automatic mileage monitoring and service reminders) and advice on eco-driving, based on the technical information sent from the car. Mapping pack: vehicle location (for example, parked car location) and e-mail messages when entering or leaving a geographical zone (for example, to inform friends and family that you are about to arrive at your destination). Tracking pack: in the event of theft, the geographical position of the car is sent to the police. The new MyDS mobile application, compatible with iOS/Android smartphones, offers a whole panoply of functions including parked car location, pedestrian navigation to final destination, servicing reminders, and access to documentation, the aim being to provide assistance throughout the customer’s journey, along with other innovative, intuitive services, plus full information on the car and on customer-specific DS offers.